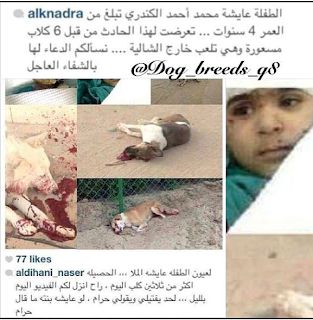 Kuwaiti amateur snipers massacred more than 30 dogs in the Gulf emirate during an attack on their hideouts in an isolated area following a dog assault on a little girl. The armed snipers from the Kuwait Shooting Club decided to form a “massacre team” and raid dog concentrations in suburban Kuwait after several animals attacked a little Kuwait girl and inflicted severe injuries on her. The team’s leader said they decided to launch the raid to avenge the attack on the girl, Aisha, adding that the incident followed reports of persistent attacks by dogs on people. I read about this yesterday on the PAWS FB page yesterday. Great way to represent the athletes of Kuwait, way to go morons. It's the worst kind of barbaric cruelty. Why isn't anyone arresting these idiots? Makes me want to cry every time I see those photos. I'm a long time reader of your blog (since I realized I was going to be deploying to Kuwait, and although I'm home now I still read pretty much daily)and I saw this on the PAWS facebook page. Is it really true? Was it documented in a legitimate news source? Did they video tape it? I can't read the Arabic details myself so just wondering what you know. How is it being back home, miss Kuwait any? Yes, t's true, you can clock on the links, several news stories on different sites. I saw it on FB but then I read about on Emirates and AL Watan. It's sad but that us the caveman mentality we have to deal with here on a daily basis from every race. Coming home, everything here in the heartland of America seemed especially lush and green. haha But I do miss being there, for some reason I quite liked it there. And I go around constantly defending the cultural and religious things that most of us (Americans) just don't understand only to see this happen. It's indefensible. I will never comprehend why this is allowed to happen with no rules about animal cruelty. I'm sorry the little girl was bitten and attacked, but "avenging" her attack by slaughtering dogs is one of the most ignorant things I've ever heard. Makes me sad. Stray dogs are scavengers and disease carriers at best, killers at worst. They are a danger to human life and must be taken care of. I don't think shooting them is any less humane that taking them to a shelter; where it's determined they don't like people and live the remainder of their life caged. Why does western culture put the life of a dog above everything else? Calling the shooters "amateur snipers" is an embellishment to the story. They certainly caused prolonged suffering to the animals. Oh, and the "Anonymous" must have found this blog through a link from a dog-hating portal where it has just been posted -- a known hanging spot for sociopaths.